but we'll be frogging in this house. 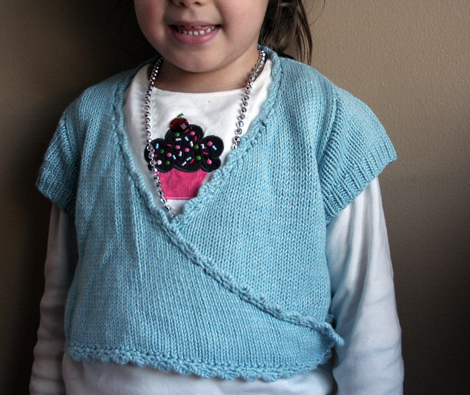 I made the girls a couple of short sleeved sweaters last summer, that I am really not happy with. 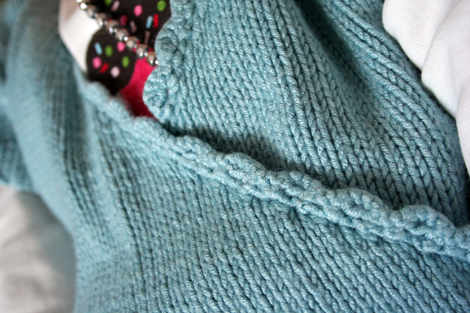 Oh I love sweater in the booklet (especially the picot edging) but on my girls I do not. It bulges and hangs awkwardly and really isn't that flattering. 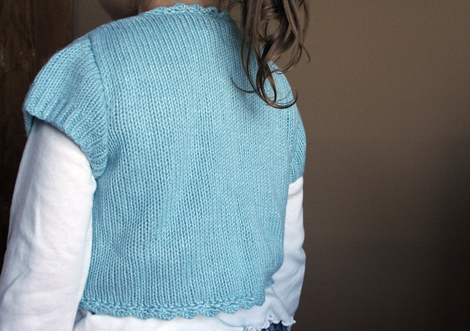 It's the first time I've knit something where I feel :meh:, not such a great feeling. For the record, I don't blame the design. So I made the decision this week to start taking the green sweater apart. It's called frogging and let me just say right now that frogging with yarn isn't nearly as fun as frogging with buckets at the beach. After painstakingly sewing up seams and weaving in yarn ends it is a knitter's nightmare to take it apart. I did not really enjoy that process. Made me almost think that I should sew seams in a coordinating yarn thread for ease of recognition but that would look ridiculous. If that weren't enough after I pulled the sweater apart and wound the yarn on a ball I immediately casted on with the yarn for another project I've been wanting to work on. After 100 CO stitches and some 30 rows the yarn had this terrible kink running through it so a-frogging-we-will-go again. It is at this point that I *sigh*. I ask myself is baby bamboo really worth all that trouble? The answer is a resounding yes! I'm giving it one more go again tonight. I've steamed ironed (a process where you hold the iron slightly over the yarn while the steam does it's job) the kinks out of the yarn, rewound the balls and I'm all set to sit down with it. Wish me luck. I need the yarn gods to smile down on me. BUT, I have been knitting. Those toastys from the Soulemama blog. I've started and taken apart my project no less than 10 times. I'll let you know if I ever get it done. I already know that with the yarn and needles I'm using my gauge is totally off (b/c I actually did a swatch ... aren't you proud of me???). But I've decided I don't care, to hell with it ... I'm just going knit the damn thing already! I figure I can always take it apart if it's not going to work. Umm yeah, I think taking apart a fully knitted sweater loses me too and I wrote the post *lol. Yay for knitting and yes, I am proud of you for doing a swatch!! What type of yarn/needles are you using?